The electric toothbrush is made of powered bristles that rapidly rotate or vibrate. This oscillation produces micro-movements which help remove plaque, bacteria, and stains that build up on the teeth. They come with advanced features such as integrated timers, brushing modes, and LED light technology. But what is the best toothpaste for electric toothbrushes? Is there even a perfect toothpaste product that can be used along with an electric toothbrush? It is worth noting that toothpaste is responsible for some extrinsic whitening of the teeth. This means that it removes stains on the surface of the teeth. That said, you might need whitening treatments if the stain comes from deeper stain that has been present for years. 1. The result you want. Some people want their teeth to be as white as they were before. This won’t happen through the use of toothpaste alone, but a whitening version may help. Others want super white teeth just as what the celebrities have, and this can be achieved through intrinsic whitening which requires tray system or several sessions for whitening treatments. Many dentists recommend toothpaste with fluoride content. Brushing twice a day with fluoride toothpaste is the most basic oral hygiene, and fluoride is proven to fight cavities that can cause tooth deterioration. However, fluoride might not be advised for certain groups of users such as children who haven’t learned to spit yet. There’s a wide array of toothpaste products that are available in the market. They have different formulations that suit different types of teeth and age groups. However, which among the best-selling toothpaste suits your needs and electric toothbrushes? Let’s evaluate three products and find out. 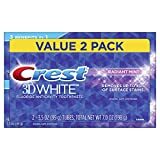 If fluoride content and teeth whitening are what you are looking for, then this Crest 3D Whitening Toothpaste is a good choice. No wonder it is one of the most bought toothpaste today, but what else can it offer? The Crest 3D Whitening Toothpaste has a formulation that can reduce surface stains up to 80%. It contains 0.243% sodium fluoride and inactive ingredients such as water, sorbitol, sodium hydroxide, sodium saccharin, and others that work together to bring back that white smile. 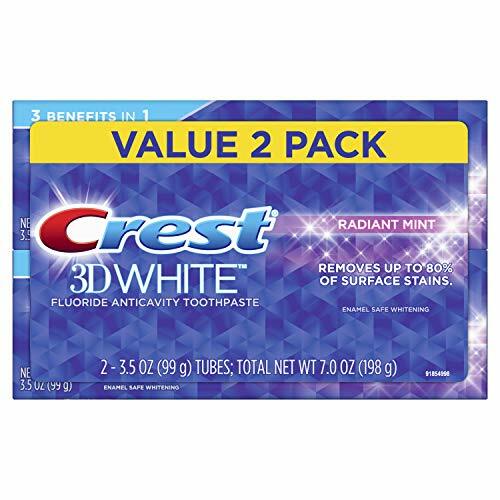 The fluoride content of Crest 3D Whitening Toothpaste helps not only in reducing surface stains but also aids in protecting the teeth against cavities. With constant use and oral hygiene, your teeth become free from bacteria, plaque, and stains. After brushing, this Crest toothpaste leaves your mouth feeling legitimately fresh and clean. This is made possible by the mint flavor. Packaging-wise, it comes in two packs, and it is available at an affordable price. Colgate has been one of the most staple toothpaste since the early years. It is an umbrella brand of oral hygiene products such as toothpaste, mouthwash, toothbrush, and dental floss. Among its best-selling toothpaste that could be used with an electric toothbrush, which is also great for a manual toothbrush, is the Colgate Total Whitening Toothpaste. 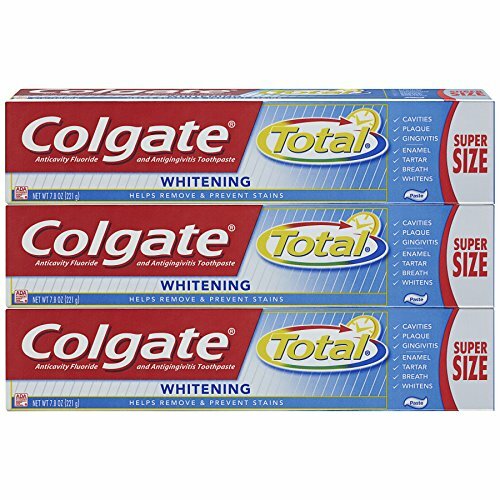 The formulation of Colgate Total Whitening Toothpaste consists of 0.24% sodium fluoride, 0.30% triclosan, sorbitol, sodium lauryl sulfate, and sodium hydroxide, among others. With the fluoride and other ingredients, this Colgate toothpaste can remove stains on the tooth surface and prevent it from further staining. Hence, it makes your teeth whiter. The formulation also works for 12 hours to prevent bacteria from setting on the tooth surface, which commonly causes bad breath. It also helps protect teeth against gingivitis, cavities, and plaque. Additionally, it is recommended by dentists around the world, so you are guaranteed that Colgate Total Whitening Toothpaste is safe and effective. It comes in three packs at an affordable price. If you are looking for a toothpaste product that contains natural ingredients, the Tom’s of Maine Toothpaste is the one for you. Is it effective in whitening the teeth and protecting it from cavities and plaque? Let us find out. Among the natural ingredients of Tom’s of Maine Antiplaque and Whitening Toothpaste are calcium carbonate, glycerin, water, peppermint oil, sodium lauryl sulfate, and carrageenan. It doesn’t contain fluoride and artificial colors, flavors, and sweeteners. Even with all-natural ingredients, the Tom’s of Maine Antiplaque and Whitening Toothpaste also helps whiten teeth by removing surface bacteria, dirt, and plaque. You will also look forward to brushing your teeth because this toothpaste has natural mint flavor coming from peppermint oil. 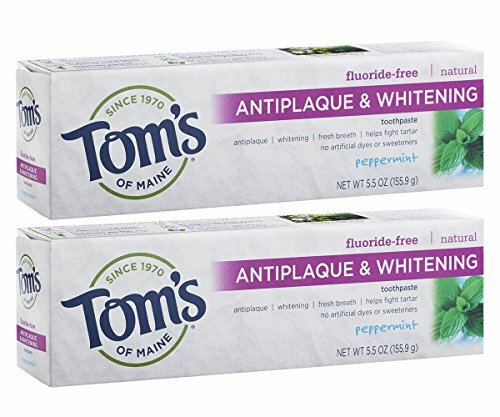 Coming in at an affordable price, the Tom’s of Maine Antiplaque and Whitening Toothpaste comes in two tubes at one price. All of the toothpaste products mentioned above are also great for manual toothbrush use. Breaking them down, most of you will choose the Colgate Total Whitening Toothpaste because it contains ingredients that work together for overall teeth cleansing. Its name is also trusted around the world, and many dentists recommend it. Similar with the Crest 3D Whitening Toothpaste, the Colgate Toothpaste contains fluoride that removes surface stains, bacteria, and plaque. 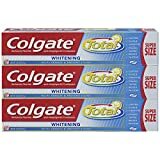 What most people like about Colgate Total Whitening Toothpaste is it works for 12 hours to fight bacteria that can cause bad breath and settle on the tooth surface. Also, it has a desirable flavor that leaves teeth feeling fresh and clean. On the other hand, for people who only want natural ingredients and doesn’t want fluoride, the Tom’s of Maine Antiplaque and Whitening Toothpaste is the best toothpaste for electric toothbrushes for them. It also helps whiten teeth and has natural peppermint flavor, but such is not desired by some users. All that said, aside from choosing the appropriate toothpaste that suits your needs and preferences, it is important to maintain oral hygiene. Brushing twice a day, flossing regularly, and visiting the dentist twice a year will help keep your teeth clean and white.